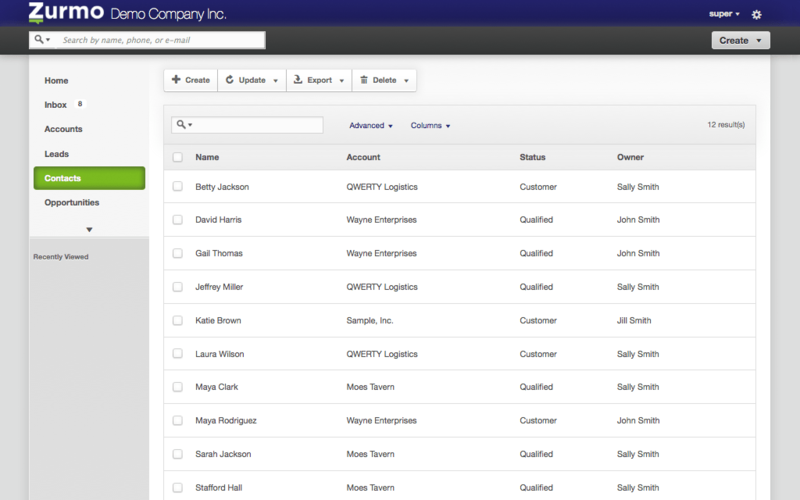 Zurmo est un outil de gestion de la relation client (CRM). Zurmo a été initialement publié en 2011. Combined Tasks Kanban - We are happy to announce the first iteration of this much requested feature that allows you now to visualize all your tasks on a single unified Kanban board. 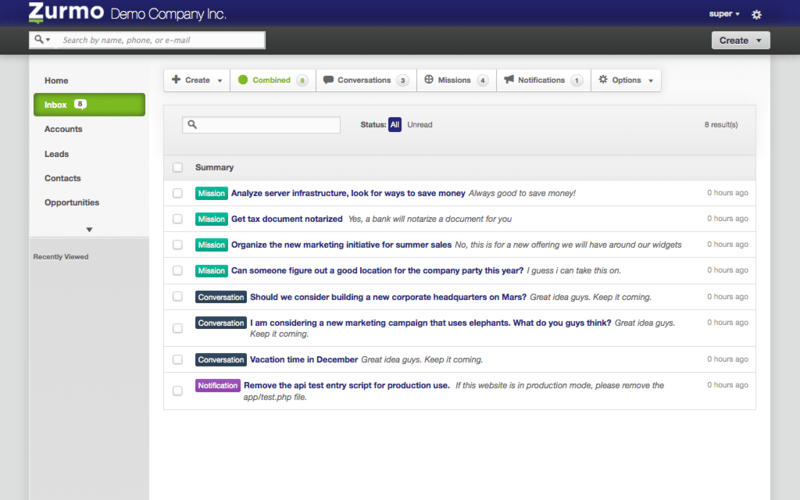 Campaign Retarget - Now you can send a follow up message to all of the individuals that viewed or clicked your campaign. Feed Comments - Feed Comments are a great way to begin a dialogue about a particular record, as well as allowing users to mention other users who may need to be involved on that feed. Mention Feature - Mention another CRM.me user in a Comment, Task, Social post, Conversation or Mission and encourage users to engage and discuss a particular item. Create Marketing lists performance optimized - Creating a new marketing list performance significantly increased! Items I Own search mode - Now you can quickly select your records on the list view. 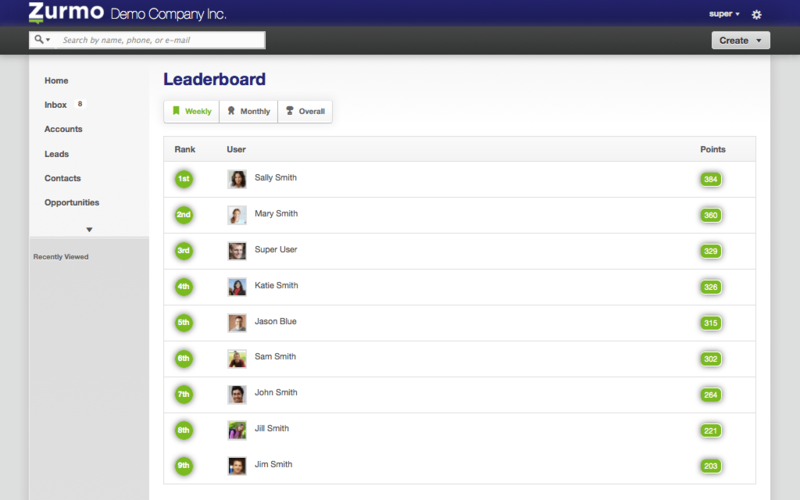 User interface - Lots of improvements and bug corrections here! Bug fix - Workflow email was generating "\" before periods and colons and returns on text area fields. Bug fix - "Opportunities by Sales Stage" portlet was displaying inaccurate data. Bug fix - Removing "Related Accounts, Contacts, Opportunities" from Inline Edit View on Notes module, prevents you creating new notes. Bug fix - Funnel chart was showing the Opp stage results ordered by "Count" criteria. Bug fix - Search results wasn't updating criteria changes. Bug fix - Carriage return issue solved. Bug fix - "My Open Tasks" owner field was showing task name. 26b8701 CRM-186 - Export job queue batch number change. 173fd6a Fixing reports functional test. 72dfa2a [#100720824] added test for new user element for reports. 3785826 fixing calendar functional test. 5c8d266 CRM-147 Dependent picklist keep old value in list. 320605b Minor change for import function test. 94ce104 [#99296674] Contact import with explicit permissions functional test. 274562c Added custom actions function for Opportunity after save. d934ee6 fixing functional tests and removing wrong usage of assertText. dd2be03 [#399296610] Enhancement of functional tests for import module. 3ecbd88 Allowing merge views in designer. 1995ade M Merged in cybperic/zurmo (pull request #947) Tooltip for TagCloud in Workflows. 53af96e Fixing method visibility in TagCloudElement. 290954f Tooltip for TagCloud in Workflows. 4631d73 Tooltip for TagCloud in Workflows. f5a1c4a Tooltip for TagCloud in Workflows. 1228565 Adding optional tooltip to Tag Cloud element. 861d799 Fixing tests related to autoresponders changes. 8ef6ff7 [#96543198] modifying functional tests for lead module. 38c62a3 Fixing the Tag Cloud element. b8d25ac Adding unit tests for Lead Conversion. 21083c3 Extending Lead Conversion functionality. 767d4e6 Disable open email count when viewing emails in crm. 655f5e3 [#90045274] Fixed csv export for Task status columns. 15de1df Fixes for sending test email (campaigns and templates) + Make visible Html tables in WYSIWYG. e634894 [#88385748] Merge tags improvements. 8182c27 [#89186800] Added tests for meeting's additional data in API response. a661ece [#89186800] Include additional data in API response. 6ee784a [#88385604] Fixing merge tags bugs. 1c68f0e fixing notification functional test. f9c3a15 [#89197700] fixing coding violations. a6e73e5 fixing notification functional test. 39107d8 Fixing Notifications system tests. 2676b27 [#86132272] fixing notification functional tests. 7e39582 Fixing Notification system bugs. 46e595e [#86132272] functional tests for notification module. 3af2c6a EmailMessage Api Controller improvements. be31716 Added API function for EmailMessage and Meeting. 60f4313 Fix for zero user sendgrid configuration. cb054b4 [#85610230] - fix. Referencing the wrong model. a449b46 changing max version of PHPUnit to 4.4.0.
a8c2e77 changing max version of PHPUnit to 4.4.0.
bff054c [#84480870] fixing email notifications. 08f8c49 fixing NotificationUtil for using send/sendImmediately. d106b3c fixing notification for comments on Tasks and Conversations. 656bbcc [#83895652] Adding test to confirm bug. Removing duplicated code from merge. 099a4e7 Fixing issue with missing functions needed. 0cf10c1 changing download link path. 4e504f1 changing export download link. 236de5d [#78135212] Send email notification to user when Export is ready. 03ffeef Fix for unit test cases. 60430c8 Fix for unit test cases. e0b0aff Fix for unit test. b06d64d evaluating menu items for url. 6815a25 [#81538680] redirecting Need Support?/Get More according to edition. 0417b4b [#81538680] redirecting Need Support?/Get More according to edition. a3eb401 [#81538680] redirecting Need Support?/Get More according to edition. 750425e [#81538680] redirecting Need Support?/Get More according to edition. ced8662 Configuration menu item visibility hook. 9c3944e fixing false failures and indenting tests. 6d5bb4d zurmo-fixes: Fix join tables for HAS_ONE_BELONGS_TO, attribute id's were previously being joined on the opposite tables. ee37ece [#81424134] fix for unmatched archived emails 'cancel' button. 3ab9a06 [#81424134] fix for unmatched archived emails 'cancel' button. a4624a0 [#81424134] fix for unmatched archived emails 'cancel' button. a27e2f1 working around issue with broken test. bee04a8 Refactoring emailMessage activity performance improvement. 07429b4 Fix for campaign if campaign has started. 0f4de3e OwnedSecurableItem related tests, about on owner change event. 21ee06c [#81208290] Removing unnecessary exception from being thrown. d5a9723 [#79229574] hiding super user from leaderboard and user selection. 9b8aebf [#80472416] stopping email notification to inactive users when mission is created. a391e48 Custom management changes related to Queues module. df0782d [#78685120 fix] inbox unread count fix. acfefa3 Reduced rows processed by Export job to 2000. 246e330 [#77492066] Changing strpos in tests to assertContains. 7c9eed7 [#77492066] Changing strpos in tests to assertContains. 0f240fb [#77492066] Changing strpos in tests to assertContains. 3518b9c [#78726722] functional tests for developer tools. caa6ff7 fixing campaign functional test. c3f49ee Fixing campaign functional test. 3785595 [#75896084] Fixed issue with group and role parent permissions not being flushed correctly. Added ZurmoNestedRolePermissionsFlushWalkThroughTest. e3b6e5a [#77560530] fixing google map error. 7858b84 [#77560530] fixing google map error. b040ab3 [#75596698] fixing issue of address filed not getting cleared while merging. 9e29112 [Delivered #77455936] Updated ExportItem to define max for serializedData. Added tests to ensure larger values in serializedData were being stored correctly. Moved convertToBytes() from PerformanceMeasurement to StringUtil. 23ba998 fixing MaketingList functional test. f82d530 fixing MaketingList functional test. 93dd56a [#76961064] Addding missing editor icons in Compose Email WYSIWYG editor and Marketing configuration. a47a65b [#76961064] Addding missing editor icons in Compose Email WYSIWYG editor and Marketing configuration. d28611b Removed extra resolveHtmlOptions() override not needed, same as base class. a4baf77 Addding missing editor icons in Compose Email WYSIWYG editor and Marketing configuration. e30d6a5 fixing UserTest for changes made in getActiveUserCount(). d1b1e65 Fixed issue with sentDateTime going unquoted. 8dfaacb  Changed email template subject to 255 from 64. 945fdc8 Adding unit test for makeActiveUsersQuerySearchAttributeData and getActiveUsers. ee680b4 [#68830044] Disable Collection and Coins popups. ac64b5e Disable Collections and Coins popups. f991a2b Filter the search attributes. ca3f6ae Code review comments incorporation. ca4bb2e Fixing the label in admin area for export. b78f7a5 Fix for export item list view. 5050f00 Changes for export item list view. e52defa fixing unit test for marketing cofiguration. 84f5627 unit tests for system configuration. f089670 [#64110102] system config setting for upper limit on page size. 95eb7b2 [#64110102] system config setting for upper limit on page size. 97be6a2 fixing projects globally searchable. ae1b6a6 making super user root at the time of installation. 967dd33 making super user root at the time of installation. 72a9854 [#74955658] moved elevate command from pro into open source. 70c53a5 [#74955658] moved elevate command from pro into open source. 85d397c [#75194280] moved Autoresponder/Campaign batch size to system configuration area. b78e17d Fix bug where changing sort order of tasks would be forgotten. 1c83b60 Detect SSL and set flag for rssfeed tool. a8a474e fix for user switcher. 43b66dd [#74517526] Created new root level configuration area under administration. 44732d0 [#74517526] Created new root level configuration area under administration. 52af98c [#74517526] Created new root level configuration area under administration. cc73dc5 [#69206484] Removing submenu items from metadata of left side admin menu. 7288e57 [#74343060] Modifying customfieldvalue.value from text to varchar 255.
b9909ff [#74343060] Modifying customfieldvalue.value from text to varchar 255.
af8bb43 [#68440394] Improved Generate Campaign Items performance. Dummy code still in place. 126a0dd [#68440394] Added support for useSQL in send and relevant functions. Added a save before sending. cb779a4 [#66773464] Customized interface in HeaderLinksView. Added support for excludeRootUsers autoCompleteOptions. Added UserSwitcherElement. b4f563d [#66773464] Removed dummy action. Added code to restrict switching to other Root users. bdf04fe misc fix for kanban, had some weird spacing issue. dd60df3 [#65569016] fixing variable name and removing unwanted variable. 207edb4 [#65569016] Alphabetization of Group Module Rights. c79d427 Alphabetization of Group Module Rights. 477a691 fixing conversation functional test. fb64753 Adding indexes to improve performance. 9be6c79 Fixing test case for error on related attribute. 56eddfc Addition of test for validation. c51004f [#72920058] - delete unprocessed autoresponderitem, autoresponderitemactivity after Autoresponder is deleted. Also delete unprocessed campaignitem, campaignitemactivity after Campaign is deleted. Execute directly via sql per Jason. 8c292ae Removing !important from builder css. 90225da Removed !important from inline css. 7e94879 Enhancement for MarketingList/email template functional tests. cb01529 Trim quotes from beginning or end of the full name for email matching. This will not impact scenarios where last names start with a quote, which is the most common place one would find a legitimate quote. bf2880f (#69195720) need to make option that is in common.php for flushing entire memcache pool upon clearCache=1, explain in common what it is for. a4262b5 Fix for gravatar get_headers() check. Specify http transport. Transport is not important here since the request is coming from the server not the client so mismatched transport will not result in an error. 00b69e8 Enhancement of workflow functional tests. 4e099c1 Enhancement of workflow functional tests. 91fe661 Fix for functional test. c946b13 Fixing CSS caching issue. 5eaee3a (#68918310) Inbox links break: Added a button to toggle iframe. Changed iframe to load url only if div is expanded the first time. 821ee30 Enhancement of email template functional tests. 5f30037 Enhacement of email template functional tests. 223da00 Enhancement of email template functional tests. 753baf1 Adding td button class. 25c60be Removing strong from button. d5e2bac Ability to check debug.php is present or not. ebfe9cb Adding product element and listview adapter. d504006 Tasks - increase character limit for name. a7b671b Capitalization of account affiliation options. f45ae0d Added makeAuthorizationViewForCurrentUser in ZurmoDefaultViewUtil. Used in OAuth authorization views. d453df9 Refactor observers to better use base class. e61b821 Adding support for email message reports. cacc5d9 Cleaning some misc text and fixing some syntax. e377f31 Removed keyframes.css and integrated it into zurmo.less. 20c97c6 This commit implements the fix for the Jobmanager for the DefaultMessageLogger. 33e2f14 Temporarily fixing issue with a bug that we cannot figure out. c831383 Fixing so projects has mass edit. fd7de1e WebForms - Bug Fix. 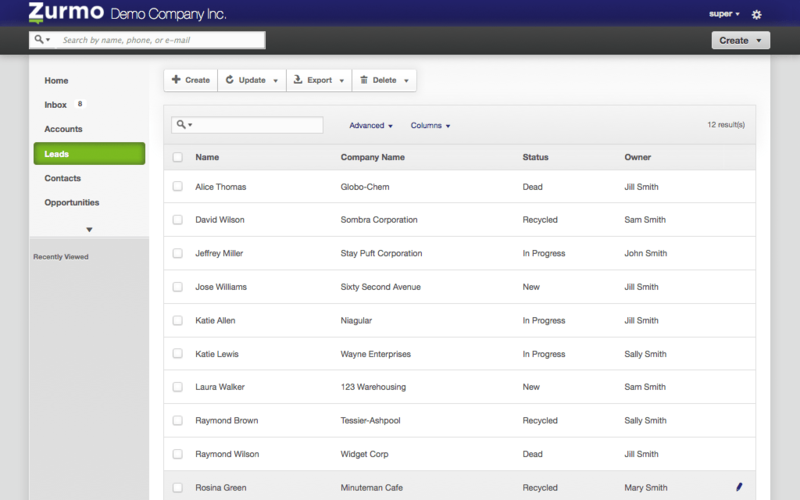 Salutation/Title is place-able attribute for web forms. 2cfad9d Webforms are ModelForm instances, it should accept these instances. ebf9462 Enhancement of TaskImportDataAnalyzerTest unit test. 632ccfc Adding proper database close in end request behavior. b323f0c Fixing icons for external web forms and gmail gadget. 3a1e563 Create meeting from calendar startDateTime populated. e35ddf0 Added enhancement of marketing functional tests. 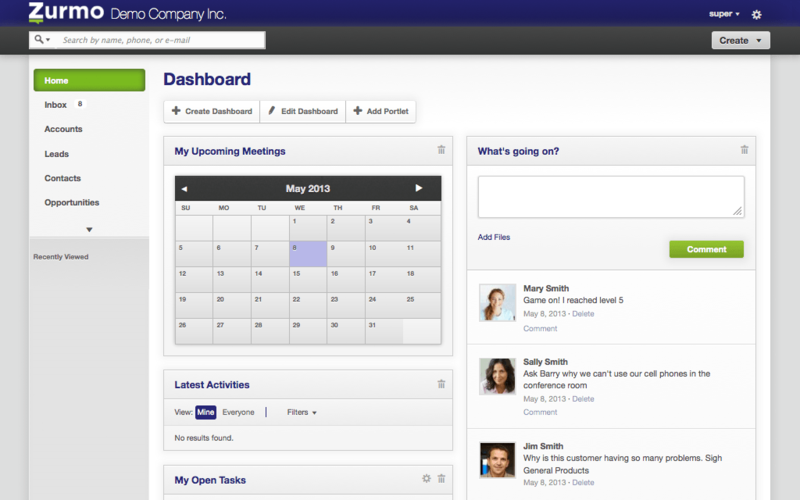 0aee4f3 Added meeting dashboard improvements. 58d4764 Additional CSS File, required for gmail gadget, inclusion sync. 47c4e61 ReadPermissionSUbscriptionUtil and ModelStateChangesSubscriptionUtil improved. 634166f Fixing BreadCrumbViews for Administration (#60033846). 8bed46e Moving redactor for email templates into an iframe (#60086916). a299130 Fixing designer issue with TaskModalEditView (#59885984). b2f6337 Fixing task activity items dont get populated when creating task from account. 5caebc6 Fixing issue with project portlet list views in designer--they should not. 25a5114 Walkthtough test for adding portlet with 2 columns on Home page. 4ea49ba fix for bug in catalog items. f68673c Adding GMT text to dates in merged fields on an email. ea3e2f9 Merge with latest zurmo(default). de4309d fix for code violations. 8ebf838 Added a wrapper around list-view table to fix issue with scrolling pager when table is too wide. 265d108 Enhacement for workflow and template functional test. bbd2e6e Enhancement for accounts functional test. 84e8815 Enhancement for accounts functional test. d52264d Enhancement for contact functional test. b204ad4 Enhancement of opportunities functional tests. fcf067e Enhancement of opportunities functional tests. 6b17815 Enhancement of products functional test. 7d3ae3d Enhancement for product templates module. 1c062ca Fixed issue with broken tests and change with minLength of strings. 846af73 Fixed for marketing functional test. 1670f1e Fixed for marketing list functional test. f3f8ce5 Fixed include failed exception. Added test to validate that. 10cd0d8 Fixed few broken tests. Notification + Export tests still broken. 7a781ee Fixed issue with message util for translating attribute labels. 8989858 Additional message script cleanup. fffbdf0 Refactoring MessageUtil and removing loose functions. 6d01599 Resolved absolute URL issue for jquery timepicker css. 3a88d14 Refactor "users by Role model" to "users by model"
c99b894 Created generic view and utils for clickable user count instead doing separately for each model. b6b04b7 Fixing: After deleting an workflow action previous ones stay hidden. 5090392 Consistency for Mass Update, not Mass Edit. 96dc5e3 Fixing layout functional test. 756f414 Refactor EmailMessageActivity, CampaignItemActivity and AutoresponderItemActivity. Updated tests and related classes. 954bb18 Fixing for layout and global search functional test. ad3bbea Renamed a method, added test to confirm unsubscribers don't get emails. 8b18fc3 Fixing Extra contact icon in Contact display. 521cc9d Fixing relations involving files. Fixed Campaign emails missing attachments for second recipient and onwards. Fixed bug that would send emails even to unsubscribed members. 572b62f Fixing Portlets, Home and Products functional tests. 0e692e9 change label from delete to unlink to be represent to the user what is happening. 457ded6 enhancement for product functional test. eef9143 Demo controller for product module. 258683a Documentation altered in accounts and activities module. f0a4e8a Fixing memory leak with running processing job for campaigns. 250d8d3 Adding additional test lines but still cannot get it to fail first. e550b03 Fixing issue with permissions and changing owner and group read/write on a model. 1208d20 Fixing bug in group controller. d1d05a2 Fixing for bug in group controller. 0879e7a After you save a group, it properly shows flash message. 23911f6 Removing extra validation check, that is not necessary. 6df8355 Adding missing behaviors for command line operation. 2ff7f2d Fixing caching issue with workflow and related model creation. 4dd73ac Fixing accounts and workflows functional tests. a1c9374 Fixing walkthrough map portlet test. 7793c11 Fixing empty/null check on emailAddress. should check empty as well as null. 5d2abff Fixing product selection label to be dynamic. 5b3770f Catching an exception gracefully. a8ffd1e Fixing css when single column porlet view. 5ea5dac Fixing issue with email addresses that are missing. 77f3565 Fixing issue with message translations not properly pulling all the labels. 73d856e Fixing issues with campaignItem creation during job and performance. 591cc73 (#53360247) Text version campaign improvements: Fixed line breaks issue in EmailHelper. 5719e7c Fixing issue with adding contacts from a report for a marketing list. 90b4d04 Fixing email template editview in chrome, the text content, there is a big white box but only part of it is clickable. Fixing bug: Unsubscribe all message dont get displayed. Fixing bug: Lead Conversion fails when converting and creating an account with required field. d669e88 Fixing several isseus with campaigns and jobs. e1f18a2 Declare variable protected for Email Configuration Issue. e817313 Create cunstructure and filter for Email configuration redirect. 6160d85 MarketingList Contact Name link changes. 2d3510f Email Adapter casing issue changes. c511bf2 Email export adapter changes. bcc0e9e Email export adapter changes.